« *** WINNERS *** Holly and Nicole are Living the Life of Riley! CONGRATULATIONS! Now that Riley is a full-fledged toddler and soaking up everything around her like a sponge, I am always on the lookout for great educational toys which are fun and entertaining at the same time. Right now, she has a thirst for knowledge and information that just won't quit and I definitely want to help her develop a lifelong love of learning. Playskool is a classic children's toy manufacturer who has been creating quality products for decades. So you can imagine how thrilled I was to have the opportunity to review the ALPHIE educational robot with Riley. Would he automatically become Riley's new learning buddy? Keep reading to find out more! 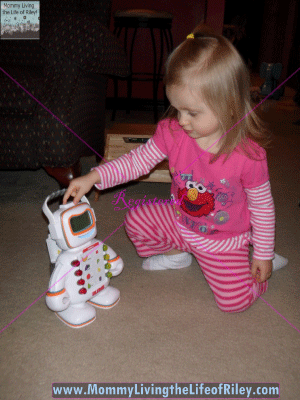 I reviewed the ALPHIE robot from Playskool, which retails for $39.99. I was impressed with ALPHIE right out of the box. He is extremely easy to operate and very engaging and entertaining too. 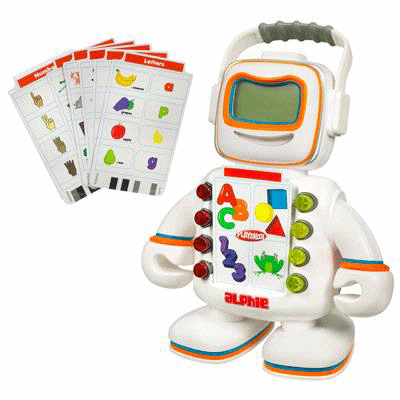 ALPHIE comes with 30 dual-sided learning cards which he is pre-programmed to read and interact with. All a child needs to do is push the button on top of his head to turn him on and then slide a card into the front slot on his chest. ALPHIE immediately springs to life and starts teaching your child a myriad of subjects, including letters, numbers, music, colors, sounds and shapes. ALPHIE has four brightly colored buttons on either side of the learning card which light up and serve as possible answers to the questions ALPHIE asks. If you get the question wrong, ALPHIE gently tries to lead you in the right direction and allows the child to keep guessing until they get it right. If you get the question right, ALPHIE plays music, lights up and pays the child a lofty compliment as to how smart they are. I really liked how ALPHIE's screen appears mostly as a face with funny and neat facial expressions, as well as a digital screen which displays letters and numbers for learning too. ALPHIE is a wonderful combination of both education and entertainment all rolled into one friendly little robot. Riley was enamored with ALPHIE from the moment she met him and although she was a little too young to interact with him completely on her own, she definitely enjoyed playing with ALPHIE. Her father and I helped guide her to listen to the questions being asked of her and lead her to understand what buttons to push. She began picking this up rather quickly and soon was able to push most of the correct answers all by herself. Since the 30 learning cards included with ALPHIE are just laminated paper, I still recommend supervising small children to make sure that they don't accidentally lose or mangle the cards. The only part about ALPHIE that I wish was a little different is the cards themselves. Because they are a loose deck of paper cards, I feel that they could be easily lost, bent or torn. Perhaps if the cards were made in thin plastic sheets, like credit cards, they would be a little less delicate and able to withstand the use and abuse of a toddler or preschooler. I also love that ALPHIE has 4 Booster Packs of additional cards available to purchase so that he can learn and grow right along with your child. Currently, Playskool has Letters, Numbers, Music & Sounds and Animals booster packs, though I could only find the Letters and Numbers packs for sale right now. I think this is such a wonderful learning tool for Riley that I have already purchased the first two sets of ALPHIE Booster Packs and will purchase the other two as soon as I am able to find them. I wish that Playskool would create an entire booster pack dedicated to children's songs, since Riley couldn't seem to get enough of the two songs included with ALPHIE. Just check out the video above to see her in action with ALPHIE and the alphabet song. What you're seeing is only the last 7-10 times she played and sang this song with ALPHIE, for I didn't actually grab the video camera until about time number six! If you are looking for a fun and educational toy that your child will love and you will feel great about giving, then look no further than ALPHIE from Playskool. This is one good-natured robot sure to become your child's new learning buddy. The expandable ALPHIE Booster Packs also guarantee that your child will find years of enjoyment and growth from this one toy, which is definitely money well spent! Disclosure: I received the ALPHIE Robot from Playskool in order to facilitate my review. No other compensation was received. This product review is based on my own personal experiences with this item and is completely honest and objective.